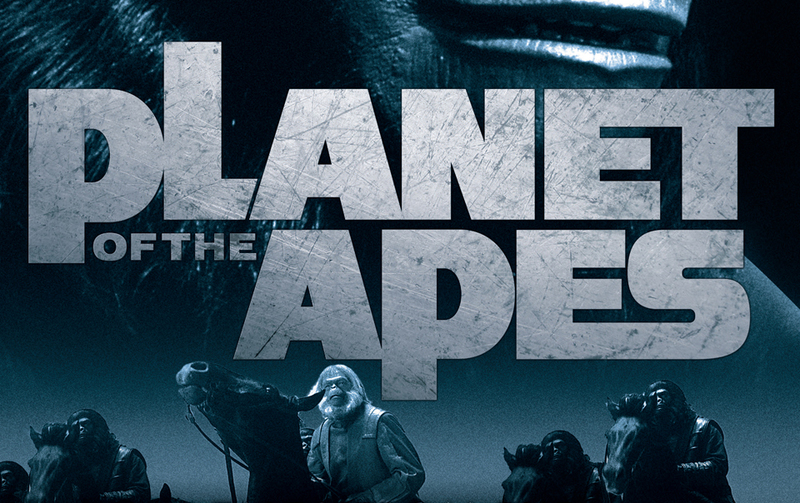 As the lynchpin for an argument regarding Planet of the Apes: Tales from the Forbidden Zone from Titan Books, Editor Rich Handley lays it on the line right from launch. I found myself agreeing with him despite my reservations about a collection of short stories based on the epic storylines from the original movies. However, the entire idea of the film franchise lends itself to this kind of work – much like the Star Wars or Star Trek universes, the foundation is in place for great authors to flex creative muscle and delve us more deeply into the world (worlds?) of Planet of the Apes. I was first introduced to the movies when I was but a young and burgeoning science fiction lover under the tutelage of my well versed dad. He would mix a half-gallon of ice cream, six shots of chocolate syrup, two bananas and a handful of strawberries in the blender and hand me a mason jar full of dessert for that summer evening’s entertainment. As Charlton Heston spat his lines at the camera and the apes, my dad would explain to me the finer points of becoming a sci-fi aficionado. Planet of the Apes was every future intrepid science fiction explorer’s Rosetta stone: Space exploration, alternate timelines, nuclear fallout. The entire franchise is a plethora of goodies to stoke the brainpans of debate and discourse. I, like every other science fiction fan worth his salt, found myself back in the universe of Planet of the Apes when I was in college. An account at Blockbuster Video and frequent late nights (and two cases of cheap beer) was the formula for the continuation of my friends’ and my education into the finer points of the creation of such an expansive science fiction world. Enter the anthology. Each story enjoys itself fully, since there are zero restrictions. Want a human narrator? Sure. Wonder about the second class humanoid race? How about General Urko running roughshod, only to be ambushed and driven back by clever humans with nothing to lose? Good golly, it’s in there! This anthology has them in spades. The writing is precise, the adventures grand, the odds dire. 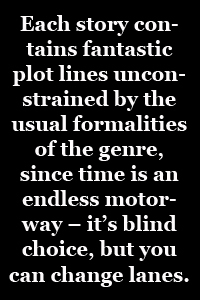 Each story contains fantastic plot lines unconstrained by the usual formalities of the genre, since time is an endless motorway – it’s blind choice, but you can change lanes. Each story in the anthology explores this infinite causeway of plot for the great benefit to the reader. My particular favorite is the first story in the anthology, “Unfired” by Dan Abnett. The story examines the idea of human religion and the effect it would have on a world which has fallen under ape control. The protagonist has to refuse all constraints of his sworn religion in order to carry an important artifact across dangerous country. The end result is deliverance, but at the cost of heartache and loss of God. I thoroughly enjoyed coming home to my favorite characters from my childhood. The comfort level of the faces I know from the renowned makeup artist John Chambers echoed in my head as I read about the time-honored apes from the films. But perhaps the beauty of this anthology is the refusal to use only the classic characters from the canonized films. The introduction of new heroes and villains keeps the pages turning. The completion of a story containing only new characters gives way to the next story filled with vintage memories. Defining the old, exploring the new, interpreting the universe I have appreciated since I was a grade schooler watching the ice cream spin around in the blender with my dad. What better praise is there than a cross-decade experience for a true fan? Now, I find myself driving a Volvo station wagon and harping over the IBU’s in the pale ale I buy at a snooty and overpriced liquor store. However, my friends, I still enjoyed the hell out of returning myself to the world of Planet of the Apes. This anthology allowed me a few wonderful nights of reading and immersing myself again in a world where humans were not the dominant species. Refreshing and satisfying. You can purchase Planet of the Apes: Tales from the Forbidden Zone via Amazon or directly from Titan Books. The 1968 film Planet of the Apes was a seminal work of science fiction that inspired generations of filmmakers and authors. Now a who’s who of modern writers – including Kevin J. Anderson, Nancy Collins, Jonathan Maberry, and John Jackson Miller – produces sixteen brand-new, exclusive stories set in the world of the original Planet of the Apes films and television series. Each writer will explore a different drama within the post-apocalyptic world, treating readers to their unique visions and non-stop adventure. What a great article! Well said DocKatz that was a great read! 3.5/ 5 Cornelius!!?? Too funny. Seems I need to make way way back to the planet of the apes. A Great read, and at times a sublime summarization of what a franchise means through tne fabric of time to the viewer. I can’t wait for the next Doc review. I will not always agree with Doc, but, the passion of his writing will always keep me wanting more. Thanks, Doc! Your review of our book was just what Doctor Zaius ordered!